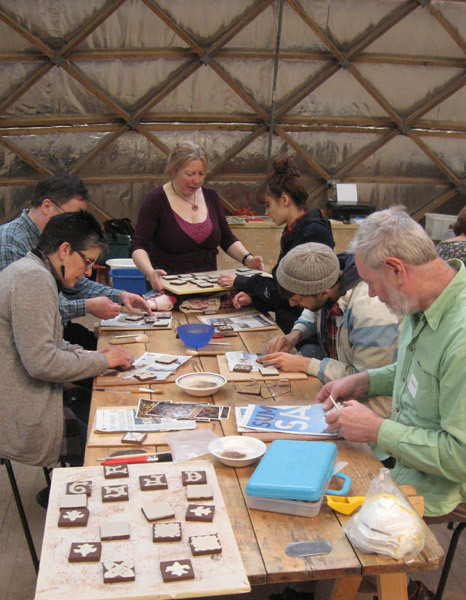 We run an intensive one day course teaching how to make medieval tiles, for adults. We currently run this at The Weald & Downland Museum, near Chichester as a part of the historic crafts series of courses. Karen developed this based on 17 years of experience in making replica medieval tiles and it is a practical day with an opportunity to create your own pattern blocks and to produce 4 copies of a tile. We cover the history and interpretation of tiles and bring Karen’s extensive reference collection of medieval tile books to consult as well as examples of real medieval tiles and our replicas. We take the student’s tiles back to our workshop to finish and fire them. We have also run this at Peterborough Museum, a Victorian themed version for Hereford Records office as part of their Godwin Tile exhibition and for the members of the Medieval Siege Society members at their AGM. This course is suitable for complete beginners to pottery as well as experienced potters and anyone looking after museum collections or in-situ medieval tiles.